khichdi recipes to control acidity. rice recipes to control acidity. With humble Khichdi, interesting Pulaos and international bestsellers too, this section speaks the magic of rice. Just what you need to make a complete meal, these perfect, Acidity fighting Rice recipes are made with simple ingredients that are easily available. Using minimal spices and oil, they satiate and soothe your tummy. Who can resist a bowlful of cool curd rice on a hot summer’s day? And if you suffer from Acidity, then this soothing bowlful is more than tasty – it is nothing short of ambrosia for you! When reinforced with carrots and cucumber, the curd rice gets all the more pleasing for your stomach and taste buds because cucumber is considered one of the best vegetables for combating acidity. You will notice that the proportion of alkaline veggies is much more than the amount of rice in this Cucumber and Carrot Curd Rice, which is a wonderful step to avoid and alleviate Acidity. Curd is probiotic and is said to calm the stomach acids. The South Indian love rice and try a variation of curd brwon rice recipe to combat acidity. Bajra is highly alkaline and we use it to make this acidity friendly zucchini bajra khichdi recipe made with less oil and spices. Another option is bajra khichdi with yellow moong dal to control acidity made with less fat and zero spices. 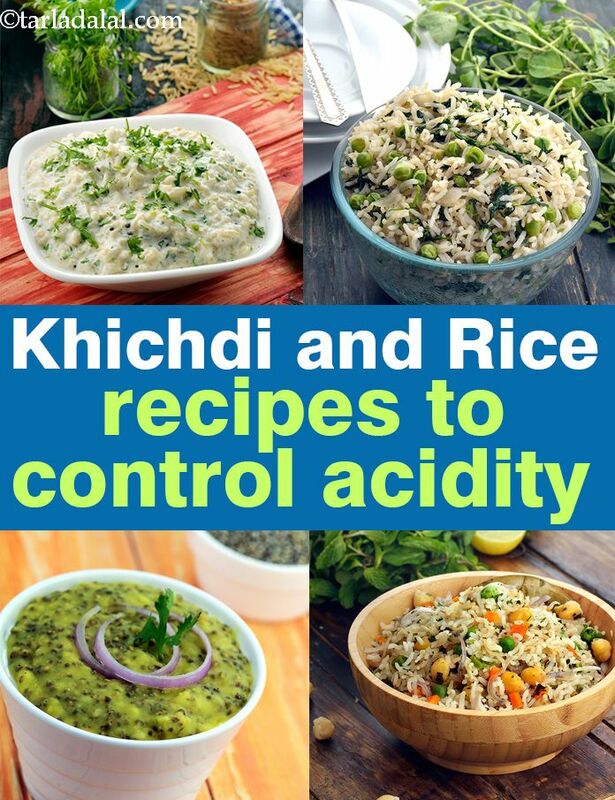 Enjoy our khichdi recipes to control acidity. rice recipes to control acidity and other acidity articles below. Suva lends its fresh taste to this rice.